Simon was born in London but soon moved to West Sussex where at an early age an avid interest in music was instilled in him due to his parents being music teachers with his mother a pianist and soprano and his father a violinist and a very competent accompanist. At the age of 11 after some false starts on a selection of instruments, Simon was enrolled in the West Sussex Music Centre and took up the French Horn. He really took to this instrument and went on to study performing at the Guildhall School of Music and Drama in London where he was taught by members of the London Symphony Orchestra horn section and Anthony Halstead who is an eminent horn soloist and regular conductor of the St Martin in the Fields Orchestra in London. During his educational period he performed in many varied groups including the West Sussex Youth Orchestra as the principal horn and a number of wind quintet and octets. He soon grew to love the intimacy of playing chamber music but still greatly enjoyed the power of being part of a large symphony orchestra. He was also a member of the West Sussex Youth Choir and sometimes had the dilemma of being in both the orchestra and the choir simultaneously which involved the decision of what area to perform in as he enjoyed and excelled at both. Simon was also asked to play with a number of orchestras all over the county for one off concerts and toured to Northern Italy with the Youth Orchestra culminating in a performance at La Scala in Milan. Simon not only excelled at the French horn but also took up the drums and following a stint with a Jimi Hendrix style rock trio while still at school and then playing drums for a number of local shows, he was soon working with a cabaret trio called the Mike Allen Sound in and around the Brighton area performing in numerous clubs, hotels, pubs and other venues. At this juncture he was introduced to Anthony Philips an ex member of the super group Genesis via friends at the Guildhall and was involved in some recording work as well as some backing tracks for Genesis themselves at around the time Phil Collins took over the lead vocals from Peter Gabriel. Simon has a love of jazz from the drumming perspective and has always enjoyed the more avant garde freeform jazz fusion as a performer as he deems it as “musicians music” due to fact that it can be very introverted but always requires an extremely high degree of competence, extemporisation and interplay between the performers and this can sometimes be daunting to the casual listener! He played a lot of jazz during this period especially with the keyboard player from the Mike Allen Sound which is what was preferred (unfortunately the audiences mostly wanted the standard pops of the period) by the members of the trio. Simon was performing all over London while at the Guildhall and his work included the Richmond Symphony Orchestra with a spin off wind octet performing regular recitals at Ham House and Kew as well as for shows at the Richmond, Wimbledon and other local theatres. He also played with the “other LSO” the London Senior Orchestra which was part of the Earnest Reed Music Association culminating in a wonderful performance of Mahler’s 2nd Symphony (The Resurrection) in the Festival Hall. One of Simon’s favourite performances was with a wind quintet, Musica Mussita, playing the Karl Neilson Quintet in Crawley which is a very demanding but glorious piece utilising the full capabilities of all the five instrumentalists. 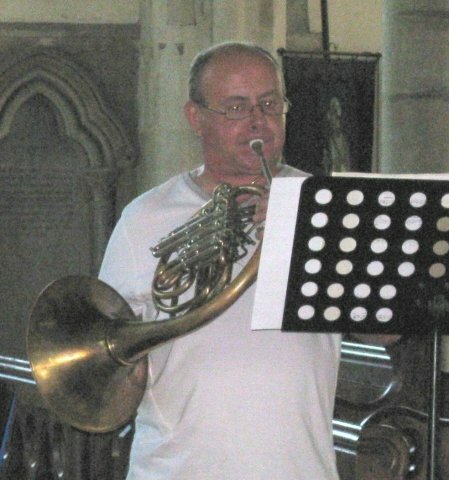 During Simon’s college years he returned to the West Sussex Music Centre as a horn teacher and was well respected by all of his pupils one or two of whom also became professional players. Prior to completing his AGSM at the Guildhall, Simon was auditioning for professional jobs to gain experience and following one of these he was offered the principal horn role in the Las Palmas Symphony Orchestra which was a well known “first pro job” location for a number of British and American musicians. Simon spent a year in Las Palmas and learnt a lot about the profession performing weekly concerts all over the Canary Islands as well as an opera season in the summer. The operas were extremely well patronised especially as they had world renowned singers performing such as Placido Domingo in Tosca, Jose Carerros in Nabucco and Rita Hunter in Caveleria Rusticana to name a few all conducted by Maestros from La Scala such as Franco Ferraris. This was excellent experience and at the culmination of this contract Simon auditioned for the CAPAB Orchestra (Cape Performing Arts Board) in Cape Town, South Africa and was given the position of Co Principal Horn. This was possibly due to the same conductors being used that he worked with in Las Palmas and his reputation was known! Simon spent five years at CAPAB and played in a vast array of operas, ballets, chamber groups, musicals and symphonic concerts. Some of which were taken on tour to other areas in South Africa. He was also asked to play with the Cape Town Symphony Orchestra (also fully professional) when extra players were required and therefore built up an enormous repertoire of experience across a broad range of disciplines. This included a number of recording sessions for film, television and radio such as the Beethoven Wind Octet with the Capab Wind Ensemble for SABC (South African Broadcasting Corporation) that was aired on a number of occasions. The film work was mostly background scores for advertising features frequently sight reading the session while the ink was still wet on the score! Other work that came his way included a monthly session with an ad-hoc professional orchestra performing masses and oratorios in Cape Town Cathedral at their special services including some taken by Bishop Desmond Tutu. In 1981 Simon was asked to join an impromptu orchestra for a three week tour of South Africa by Rick Wakeman who was performing his King Arthur and other tales composition. He enjoyed this immensely as he had been a fan of the progressive rock group ‘Yes’ that featured Rick Wakeman on keyboards for a number of years. During the time Simon was with CAPAB he also took up teaching horn at the Cape Town Diocesan School (Bishops) and also ran the award winning brass band. Other peripatetic teaching experience included university music students specialising in the French Horn at both Cape Town and Stellenbosch Universities. When Simon returned to the UK in 1984 he all but ceased playing and performing apart from some very sporadic occasions due to family and other work commitments and never went back to playing professionally. He had a brief spell with the Poole Rehearsal Orchestra in 1986 and returned to play as a guest in a West Sussex Music Centre concert in 1987. In 1994 he played in a large open air proms concert to an audience of 10,000 people and in 2003 was asked to play drums in a production of Return to the Forbidden Planet. Simon was also asked to tutor the brass and to conduct a Scout marching band in Cadnam which had to stop when he moved away from the area. He was also invited to play with a chamber orchestra for the Camerata Choral Society at a concert in Sherborne Abbey in 2005 and this led to a resurgence of his enjoyment of performing. Since moving to the Isle of Wight in 2005, Simon has now fully returned to his love of playing and performing and is now a member of the Isle of Wight Symphony Orchestra and the Island Concert Band, The Savoyards Opera Group in which he has sung as a chorus member, played horn in the orchestra and drums in a trio for their recent Novello show. He is also a member of The Solent G & S Society where he had a small role in Pinafore followed by the lead role of Robin Oakapple in Ruddigore which led him to be their current Musical Director performing a concert during the 2008 Cowes Week and most recently, a very successful production of The Mikado. Simon was also asked to be the Musical Director for The CAODS (Cowes Amateur Operatic and Dramatic Society) production of Oliver in July 2008 that proved to be one of the most profitable shows they have performed. Simon is also now frequently booked to play in impromptu orchestras for local choral groups such as Ryde Chorus, The Cantata Choir and an Austrian style “Oom Pah” band that plays ad-hoc gigs as required. He now spends most of his free time playing or rehearsing.